The best Kuzu Pirzola I have ever eaten was in the Bosporus Restaurant in Dubai. They are delectable! I wanted to recreate this taste sensation, but although my recipe is really good, it's still not as good as the Bosporus. This is probably because the Bosporus use a large, open flame grill to cook their food and this adds a hint of smokiness to the flavour. 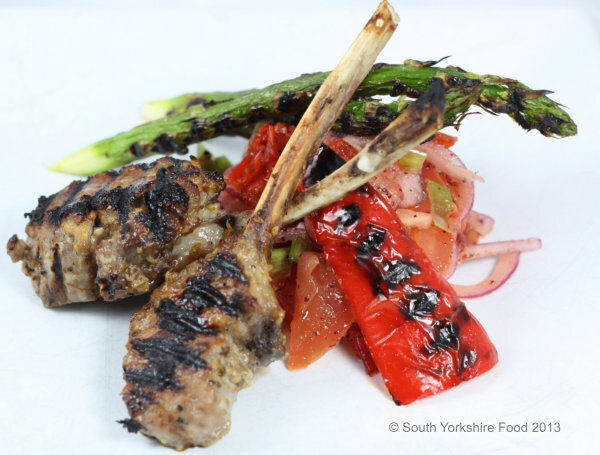 This recipe will give you juicy, flavoursome meat and the red onion relish with the lemony sharpness of the sumac and mild heat of the pimentos makes a good taste counterpoint to the grilled lamb. Depending on the size of the cutlets, this will serve 3-4 people. Add the lamb cutlets to the bowl, cover and marinade in the refrigerator for 4-6 hours. About an hour before cooking, mix the relish ingredients together in a bowl, making sure the sumac is evenly distributed throughout. Cover and set aside. Prepare the vegetables, sprinkle with olive oil and sea salt. The chops and vegetables taste best cooked on top of an open flame grill, but a grill pan works well, too. Heat the grill pan until it is smoking hot. First grill the vegetables - these will only take a minute or so on each side. When cooked put them on a warm plate, until the lamb is cooked. Now grill the cutlets. Shake off any excess marinade, and grill the cutlets for 2-3 minutes a side for a medium done cutlet, or longer if you like them more done. Resist temptation to move them about, turning over once should be enough. Serve with the relish and grilled vegetables.